Mountains, sea and shopping – such a winning combination. Clever, clever Lorne. The boutiques may be expensive (the price of the skirt Time Out bought was an outrage, frankly), but they’re so inescapable that if you stroll down Mountjoy Parade you’re guaranteed to spot a flotilla of Melbourne women sporting new nautical purchases. 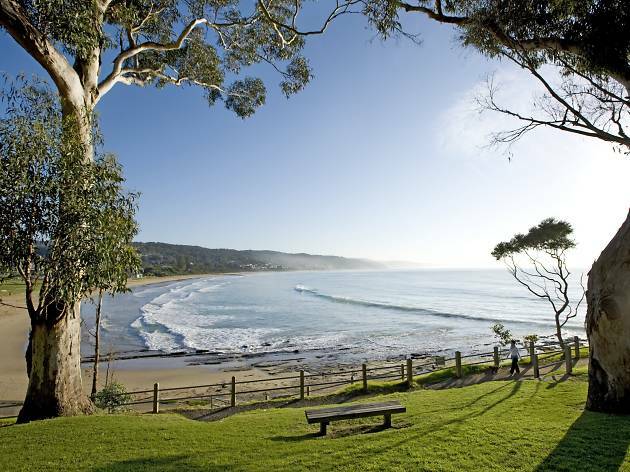 And with whale watching, pier fishing, paddle boating, bushwalking, surfing and an Art Deco cinema on offer all year around, it’s possible to enjoy the ultimate beach holiday in Lorne the same afternoon you leave the city. At the gateway to all this is the ridiculously well appointed Mantra. 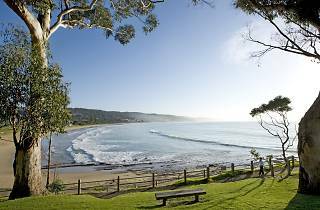 A stone’s throw from the foreshore market, it’s the only Lorne hotel on the beachfront. The Heritage-listed Eskine House, built in the 1860s, is surrounded by 277 rooms, ranging from one-bedroom apartments to studios, with a range of conference rooms and a grand ballroom. Guests are offered bikes and buggies for hire, and there’s an indoor pool, tennis courts, and free croquet, golf clubs and bocce sets to be used on the ample lawns; even an onsite Endota Spa. The sense of history is preserved with framed black and white photographs of the bygone era. Lorne has eateries on offer to tempt every palette, but dining in-house at the Mantra’s own Brasserie 144 (also open to non-guests) means you can eat either in the elegant restaurant or out on the lawns. The duo of swan hill duck ($29) and the Tasmanian salmon fillet ($32) were both winners with us. Tie in your visit with one of Lorne’s annual sporting events, like the Pier to Pub swim, Mountain to Surf run, the Great Ocean Road Marathon or the Anaconda Adventure Race, or come at New Year for some international music courtesy of the Falls Festival.